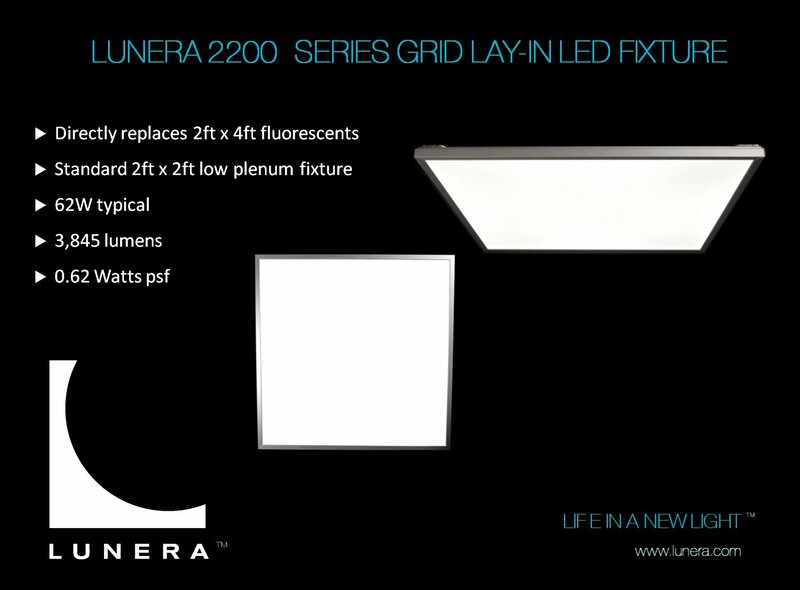 Introducing Lunera Lighting's 2200 Series LED Grid Fixture that directly replaces 2ft x 4ft fluorescents with a low plenum 2ft x 2ft fixture to the commercial market. Lunera Lighting's 6400 Series 4' Suspended Linear LED Fixture is ideal for highly designed applications. REDWOOD CITY, CA--(Marketwire - October 26, 2009) - Lunera Lighting, a designer, manufacturer, and marketer of next-generation digital LED lighting, is now selling its ultra-thin, energy-efficient LED fixtures to the commercial general lighting market. Lunera's design approach creates fixtures that deliver efficiency and provide design elegance to commercial spaces. The company began installing fixtures at beta sites throughout North America in early 2009 and began shipping production units in the fourth quarter of 2009. 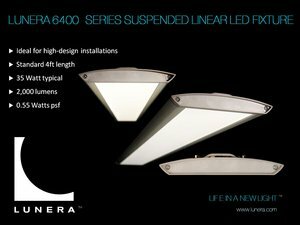 Visit Lunera in Booth 1658 (lower level) at Greenbuild Expo 09 to see the new lighting fixtures. "Light affects everything we see and do. Our engineers and artisans created a state-of-the-art design that offers beautiful, soft light and delivers long term value," said Michael Lesyna, Lunera President and CEO. "Our focus is on LED lighting innovation to create a better, more productive work environment while reducing the operational costs and the carbon footprint of the building. The resulting technology has been applied to our grid lay-in and suspended fixture products," Lesyna added. This state-of-the-art, dimmable, ultra-thin architectural suspended linear fixture is designed as a direct replacement for 4' linear fluorescent lighting in commercial environments such as open offices, schools, data centers, retail floors, and hospitals. The artistically designed fixture provides soft, voluminous light that is ideal for applications requiring low-lighting power density. The Lunera 6400 Series ships with an adjustable aircraft cable suspension kit. visible demonstration of a commitment to sustainable building design. take comfort in knowing the light source is free of mercury and lead. Designed for grid lay-in (dropped ceiling), or surface mounted applications, the dimmable 2' x 2' LED fixture provides uniform, daylight-quality lighting that is ideal for applications including offices, schools, and health care facilities. The 2200 Series directly replaces traditional 2' x 4' fluorescent fixtures without changes in the existing ceiling grid layout or electrical infrastructure. The Lunera 2200 Series has an anodized aluminum finish with various trim kits available. maintenance costs over an expected 10-15 year life. Parties interested in Lunera Lighting fixtures can contact Lunera at 650-241-3875 or by email at inquiries@lunera.com. A Lunera lighting consultant is available to answer questions, provide information, and create a free space evaluation to determine payback. Lunera Lighting is a technology innovator leading the transformation of lighting from traditional fluorescent lighting to energy-efficient LEDs that produce soft, uniform light. It designs, manufactures, and markets high-performance LED lighting fixtures for the replacement of common fluorescent fixtures. The company has created new lighting solutions that improve the quality of light for building occupants, lower operating costs for building owners, and support sustainable building design. Made in the USA, Lunera's products adhere to clean manufacturing standards and are particularly attractive to clients seeking LEED certification, since LED lighting substantially impacts LEED points in "green" buildings. The company is a firm believer in social responsibility and has made it part of their corporate philosophy. ©2009 Lunera Lighting. All rights reserved. Specifications are subject to change without notice. Lunera Lighting, the Lunera logo, and Life in a New Light are trademarks of Lunera Lighting, Inc. All other trademarks are the property of their respective companies.